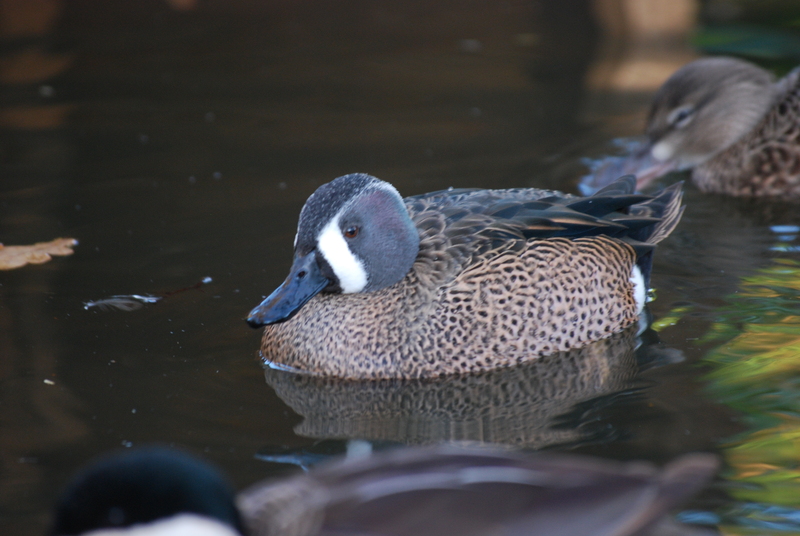 The Blue-winged teal is a relatively small member of the tribe and breeds over much of central North America with particularly high densities in the prairies, it then migrates over considerable distances to winter in Central and South America. While the Blue-winged Teal is not a particularly colourful bird it is never the less a great species to include in a mixed collection and it is very easy to maintain. Care does need to be taken when introducing new pairs, the pair bond is not particularly strong and Blue-winged will readily hybridise with many other species. If it is possible to keep a new pair in a separate enclosure for two or three weeks so that they start to bond before putting them out in the collection this can often help. The male is really very amusing when he is displaying and swims rapidly across the pond while frantically pumping his head up and down and uttering an interesting call. Blue-winged are very easy to accommodate and can be relied up to breed in their first year. They have a strong preference for natural nesting sites but will also use ground nest boxes. The natural sites can be surprisingly difficult to locate even in relatively small collections. Eggs are laid on consecutive days, the first egg is not covered and it is at this point that the nest is easiest to find, once the second egg is laid the female will start to add some down to the nest and will certainly cover the eggs with leaves and grass making it very difficult to find. Even when the female is on the nest they are difficult to find being masters of camouflage. The first egg can be expected any time from the middle of April and if clutches are removed for artificial incubation you can expect to get three and sometimes four clutches from a female. The male will go into his eclipse plumage in early June and at this point the female will also stop laying. The eggs are quite elongated and creamy olive in colour and require handling with care as they are surprisingly delicate. The first clutch will usually consist of ten to twelve eggs, subsequent clutches will be slightly smaller and incubation is about twenty three days. The small black and yellow ducklings are delightful and relatively easy to rear on crumbs but care needs to be taken in the early stages when they can easily get a chill and die. Once they are about a week old they will thrive and losses from this age on are very unusual and the ducklings will grow rapidly. As adolescents the young males and females are virtually indistinguishable and the males are very late obtaining their first breeding plumage that may not be attained until January. The breeding plumage will be attained some months earlier in subsequent years.